Taken from a video on Shiva Ayyadurai’s campaign website, this still shows the campaign bus that has provoked threatened fines from the city of Cambridge. BOSTON (CN) – A political opponent of Sen. Elizabeth Warren brought a federal complaint Sunday in defense of his right to make the Democrat’s heritage the chief focus of his election campaign. Represented by the firm Cornell Dolan, biomedical engineer Shiva Ayyadurai says the city of Cambridge has threatened him with $300-a-day fines over the campaign bus he keeps parked in a lot at 701 Concord Ave.
For the last month, the bus has been emblazoned with the message “Only a Real Indian Can Defeat the Fake Indian,” paired with one picture of Ayyadurai and another of Warren, doctored to make it look like she is wearing a Native American headdress. The Mumbai-born Ayyadurai announced his candidacy a year ago and has sent Warren two DNA kits since then to corner the progressive senator about whether she has Native American heritage. Seizing on Warren’s anecdotes about learning from her grandparents that they had Native American ancestors in Oklahoma, conservative news outlets have fixated for years on a 1996 article from Harvard University’s student newspaper The Crimson, which touted then-professor Warren as an example of diversity among the faculty. The article came at a time when Harvard was under fire for lacking diversity, but there is no evidence to suggest that Warren ever benefitted professionally or academically by claiming to be part Native American. Cambridge officials have not returned calls and emails seeking comment. The complaint quotes an Ayyadurai campaign official as telling the Cambridge inspector on April 4 that the slogan could not violate building codes since it is affixed to a bus, not a building. The next day, according to the complaint, Cambridge officials sent the campaign a letter stating the bus was in violation of a zoning ordinance that required a permit to display certain signs, and that the campaign would face fines of up to $300 a day if the banner was not removed. The Ayyadurai campaign again disputed those claims, but states it has not received any fines. “Dr. 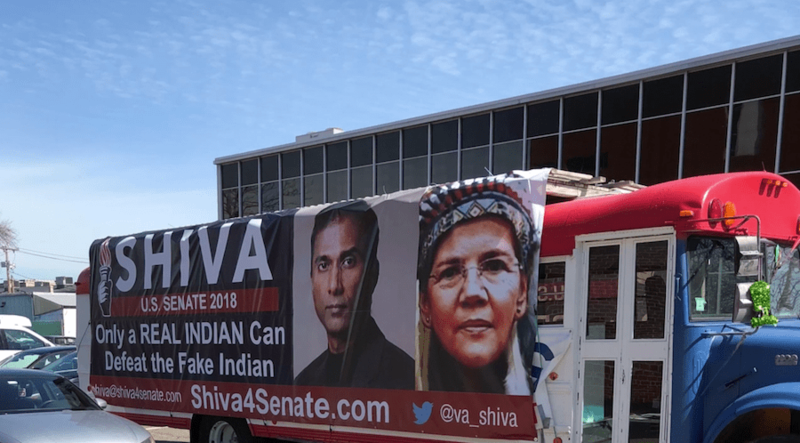 Ayyadurai and the SHIVA 4 SENATE campaign live in daily uncertainty whether the city will present them with a demand for days or even months worth of $300 a day fines for purported sign violations stemming from the political message on the campaign bus,” the complaint states. Ayyadurai seeks a court order enjoining the city from fining the campaign over the banner. An estranged second husband from the actress Fran Drescher, Ayyadurai initially registered for the 2018 election as a Republican but refiled as an independent. Earlier this year, Ayyadurai took credit for forcing Warren’s decision not to run for president in 2020. Ayyadurai’s 9-page lawsuit against Cambridge spends nearly an entire page detailing his claim that he invented email back in 1978 via a messaging program he coded when he was 14 years old. Over the years, Ayyadurai has sued several publications that disputed that claim. Though he won a $750,000 settlement with Gawker in 2016, Ayyadurai lost a similar defamation claim the next year against a tech blog that said his email claims were false.